The Pioneer LX70A lacks the hardware to be upgraded to Blu-ray Profile 1.1, but its LAN connection does at least allow it to go online and download new firmware. This is a significant boon. While taken for granted with HD DVD, it's still rare on dedicated Blu-ray machines. It's also fully-compatible with both Dolby True HD and DTS HD Master Audio, giving cinephiles access to every audio format in use. If you've got a swish new AV receiver equipped with a full set of next-gen decoders, it'll even bitstream audio out for external digital-to-analogue conversion. This audiophile attention to detail bodes well for Pioneer's next BD release. I'll be hoping for both DVD-Audio and SACD support as well, although there's little indication from the brand that it'll deliver on that. You can use the LX70A as a conduit from a PC to stream compressed audio and video to your AV system. The deck recognises WMA Pro audio files up to 768kbps, plus MP3, MPEG-1, -2 and WMV, being PlaysForSure compliant. In this regard, it's comparable to a PS3. Backside outputs include a bank of 5.1 phonos, allowing the player to pump its audio mead into any suitably equipped receiver. 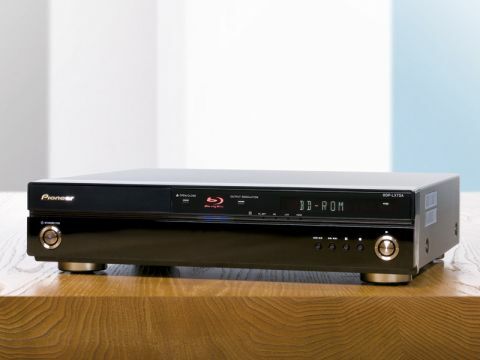 If you've upgraded to a more contemporary AVR with HDMI v1.3 inputs, all you need to connect is one HDMI cable to get a full 7.1 sonic outpouring from suitably encoded discs. Visually, the deck is at least distinctive, although to be frank, I'm not a fan of it's overtly glossy facade; it has been styled to match other Pioneer components. I also dislike the way a disproportionate part of the fascia pings out when you eject the flimsy tray. Elegant it is not! My colleague expressed some reservations over the picture quality of the first-generation LX70 when he reviewed it last year, but I have no qualms about the video quality of this new iteration (not that there's any technical improvements claimed for this player). Fed a variety of above average-platters, its 1080p24 delivery proved a genuine thriller. Images can be outstandingly crisp. The deck's ability to handle heavy Java discs is better than the first-gen Samsung player but still not great. Disc-loading times are tardy. Day After Tomorrow, a platter notorious for featuring more Java than Starbucks, takes over two minutes to play. Tea anyone? Overall, I'd say that this is the only pre-profile 1.1 dedicated player that genuinely has any legs. And it earns that kudos through its superior audio compatibility and LAN functionality.